You may find yourself in a position where you appear to have your feet in the wrong position for the next move. Rather than making the next move an awkward one it is often possible to shift your feet around in one of three ways, the foot dance, foot match or foot swap – changing the foot that is stood on a crucial hold. The foot dance requires three footholds to choose from and making a series of moves until you manage to get the other foot on the foothold you want. 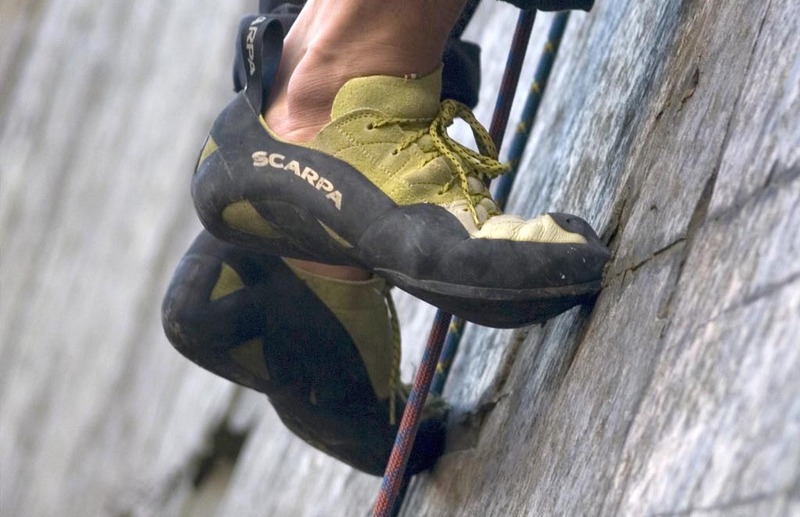 foothold and you may be able to get both feet onto the single hold. The foot swap or hop is needed where the foothold is too small to match on, and there are no options for a foot dance. Place your second foot directly above the foot you want to replace, get the big toe right above the other, and hop. During the hope remove the lower foot and the top foot should drop right onto the hold. On a traverses and routes when warming up make foot swaps on every move, remember to try the foot dance, foot match and foot swapping. As you get more confidence start making more and more tenuous foot swaps, eventually you will have an idea of how small a foot hold you can do this on.